What Are Digital Stamps and How Are They Used? Digital stamps are becoming increasingly popular. They present a stamper with a whole new range of crafting opportunities. 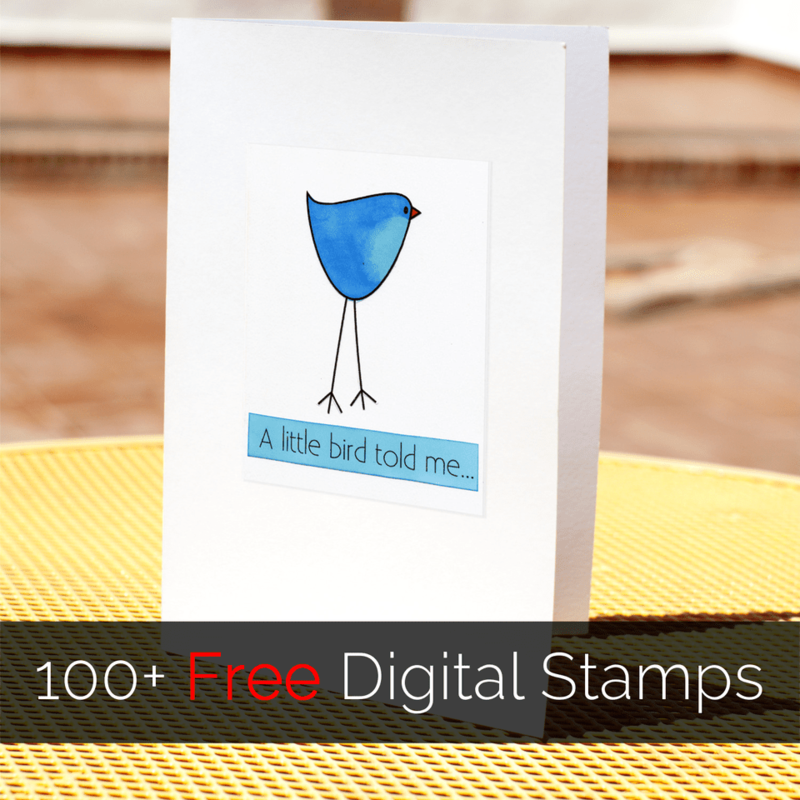 If you are looking for free digital stamps then we have plenty here for you to try - 100+ Free Digital Stamps. Read on to learn more about digital stamps and how they are used. Follow the links in the paragraphs to learn more about a particular subject. Digital stamps, or digi stamps, are black and white digital images that are downloaded onto a computer where they can be manipulated before printing out. At their most basic, when they are printed out digital stamps are just like traditional rubber or clear stamped images. One of their attractions, however, is the fact that the images can be resized, flipped (create a mirror image) or manipulated in other ways before printing it out and colored in the same way that a rubber stamped image is colored. This gives a stamper a range of new design opportunities. The most significant difference between digital stamps and traditional stamps is that there is no physical stamp. A digital stamp is just the image. Digital stamps are typically in two formats: PNG and JPG. PNG files have a transparent background and therefore can be layered with another image (see JPG and PNG comparison for more details). JPG and PNG are just two of the technical terms you may come across as you start your journey into digital stamping. How are Digital Stamps or Digi Stamps Used? Once they have been printed out, digital stamps are used in much the same way as traditional stamps. This means that they can be colored and embellished. The finished images can be cut out and incorporated into handmade cards, gift tags, scrapbooks and a whole wide range of other papercraft projects. One of the key issues about digital stamps or digi stamps is that they generally need to be cut from the paper or cardstock that they have been printed on before they are used. This is because it is generally easiest to compile the different elements of a project when they have been printed. Experienced digital artists, however, will be able to produce wonderful works of art completely on the computer. What Do I Need to Use a Digital Stamp? The process of buying and downloading a digital stamp is relatively simple. You don't need anything special to use a digital stamp. As long as you have access to a computer and a printer you will be fine! Some digital stamps are provided in ZIP files, so you will need to know how to unzip a file. If you have access to a photo manipulation package then you will be able to do more with your digital stamps. Many word processing applications will also allow you to ​resize your digital stamps. You will also need to know how to download and save a digital stamp. When digital stamps or digi stamps have been printed from a computer they can be colored in the same way as traditional stamped images. One limitation is that the images will be printed using normal printer ink and not a specialist rubber stamping ink. Therefore there may be issues with the ink running if a wet coloring method is used. It is possible to heat set printer ink using a heat tool to reduce the likelihood of this happening. Pens, pencils, and paints are all suitable for using with printed digital stamps. Because digital stamps are printed from a printer and not stamped with rubber stamping inks, special effects that are achieved by using these inks are difficult to achieve. Techniques such as heat embossing or other techniques that require materials to be applied to the ink are difficult to achieve. This does not mean that they are impossible, however, as the outline of an image can be traced using an embossing ink pen and the image finished as normal. See How to Emboss Digital Images and Emboss Digital Images with an Embossing Pen for more information. While many techniques are possible or can be recreated using a little ingenuity, others remain impossible. Using the three-dimensional nature of traditional stamps is impossible to achieve with digital stamps. This includes any techniques that impress an image into a surface such as stamping into clay, velvet or other materials. You can also apply a digital stamp to a template (such as a gift box template) before printing. This offers a number of advantages, not least that you can accurately position the digital stamp. In addition to the limitations already identified, the other main limitations of digital stamps are that they are only suitable for projects where printed images can be used. This means that using digital stamp images on surfaces that cannot be run through a printer is difficult. Therefore it will be difficult to use digital stamps on fabric, very thick or very thin paper and cardstock, large pieces of paper, pre-formed boxes and many other items. Again, this does not necessarily mean that it is impossible and workarounds can be found. This is likely, however, to involve some compromises. Although purists will question the name 'stamp', the fact that many of the features of digital stamps are shared with traditional stamps makes them yet another addition to the ever-expanding stamping family. Digital stamps are subject to the same copyright laws as rubber stamps and images. Digital stamp companies will have a digital stamp angel policy or set of terms and conditions that outline how a digitally stamped image may be used. Want to Learn About Digital Stamps? This Guide Will Get You Started!